The SATs (Standard Assessment Tests) are administered in Key Stage 1, Key Stage 2 and Key Stage 3. They are used to show your child’s progress in comparison with other children of the same age. In Key Stage 2 the SATs take place in May and cover English, Maths and Science. The tests last for 5 and a half to 6 hours in total. These standard assessment tests provide information about the levels pupils have achieved at the end of Key Stage 2. Papers are sent away to be independently marked and results are available before your child leaves primary school. Results are passed onto secondary schools and the SATS results, together with the teacher's assessment are used to stream your child at secondary school so it is imperative that they are taken seriously. To help your child it is important to keep up-to-date about what your child is learning, regularly review their books (looking out for error patterns) and associating number facts with everyday objects. Many parents are concerned about whether or not they should hire a tutor. If you feel your child is having difficulty with a particular subject or subject area then a tutor could well be a good option as they can help your child to focus on what they need to know. Get your child to create a study timetable early on in the year so that all topics get covered and your child will not end up studying at the last minute. Help your child to tackle problem areas one at a time. It is easy for your child to become overwhelmed with the amount of work covered. Agree a homework routine with your child early on and it will be much easier for them to focus when it comes to the SATs. Encourage your child to benchmark him/herself against their own past performance, not the performance of others. Help your child to feel a sense of achievement for working hard and for making progress. Help your child to build in their study for leisure time. Exercise and getting outside for some fresh air is important and is great for combating stress. Your child will need a quiet, comfortable place to study, free from distractions such as younger siblings, television and the telephone. They should use the same place everyday. In classes, your child’s teachers will talk about topics they should be studying. 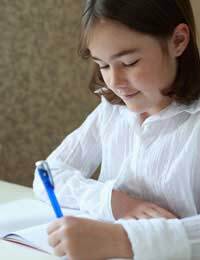 Encourage your child to take good written notes on what their teachers say. Provide your child with healthy, balanced meals with plenty of fruit and vegetables. Visit some of the SAT preparation websites online for past papers, tests, answers, examination guides and top tips on how to survive the SATs. Key Stage 2 SATs are important and the appropriate time should be set aside for studying. Provide your child with as much support and guidance as possible and make sure that your child is well prepared for the exams. Help your child to be positive about the work they have done and what they have achieved.